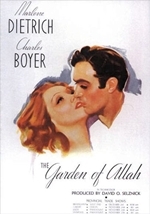 The Garden of Allah (1936) is a dramatic film made by Selznick International Pictures, directed by Richard Boleslawski and produced by David O. Selznick. The screenplay was written by William P. Lipscomb and Lynn Riggs, who based it on the 1905 novel by Robert S. Hichens. Hichens's novel had been filmed twice before, as silent films made in 1916 and 1927. This sound version stars Marlene Dietrich and Charles Boyer with Basil Rathbone, C. Aubrey Smith, Joseph Schildkraut, John Carradine, Alan Marshal, and Lucile Watson. The music score is by Max Steiner. It was the fourth film to be photographed in Three-strip Technicolor, and (uncredited) cinematographers W. Howard Greene and Harold Rosson received a special Academy Award for advances in color cinematography. The filming locations were in Buttercup, California and Yuma, Arizona.